At Haley Marketing, we are experts in...(can you guess it?) that's right, marketing! As marketers, we love to test ideas, and this summer we decided to see if writing more blog posts would generate more sales leads. >> See the full results from our test. 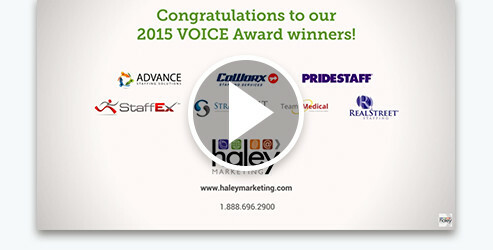 We are thrilled to announce that Haley Marketing clients won SEVEN 2015 VOICE Awards! Seven! And two of those were best-in-class awards! Want to see these award-winning websites, social media campaigns and corporate identities? From all of us at Haley Marketing, I want to extend a big CONGRATULATIONS to our clients...and just as importantly, a THANK YOU for giving our team the opportunity to do some really amazing work. And if you'd like to discuss ideas for your firm (and maybe how we can create some 2016 award winners), please contact us at 1.888.696.2900 or [email protected]. What can we do to attract more candidates to our jobs? Where is the best place to invest in marketing for staffing? On-Demand Webinar: Is Social The New Cold Call?